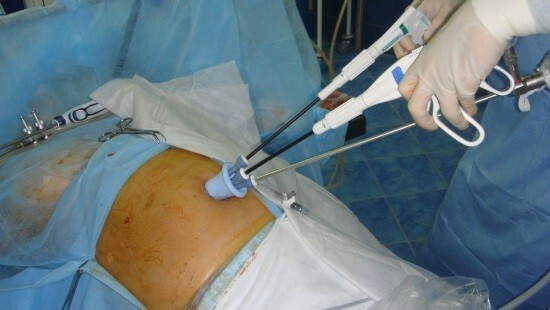 Laparoscopic surgery become the gold standard in the surgical treatment of diseases of the abdominal cavity. The method is characterized by low traumatism and high efficiency. However, as with any treatment, there are complications after a laparoscopy can lead to serious consequences for the patient. Prevention is the most important task of treating the patient with any disease of the gastrointestinal tract, female reproductive system, etc. However, such benefits persist only in the case if operative treatment was carried out in accordance with the rules and standards. Otherwise, you may experience complications from the laparoscopy. Violation of the integrity of the internal organs in the result of careless performance of surgery. The most common cause of such problems – poor visibility of abdominal contents or the use of inappropriate equipment. Internal bleeding during and after surgery. This situation arises as a result of damage to the blood vessels or insufficient bleeding from existing arteries and veins. In individuals with risk of development of thrombosis (generalized atherosclerosis, coronary heart disease, etc. ), the formation of thrombotic clots, both during the procedure and the rehabilitation period. It is very important to provide appropriate measures of prevention – elastic bandaging of the lower extremities or the use of special compression hosiery, as well as the appointment of drugs that prevent blood clots. Violations of the cardiovascular and respiratory activities is very rare. During the laparoscopy the abdominal cavity is injected a certain amount of carbon dioxide to improve the visualization of internal organs. However, an excessive amount of this gas can lead to disruption of the heart and lungs. The use of different types of coagulation to stop bleeding or removal of part of the body can cause the appearance of the burn damage associated with considerable rise of temperature of the instrument. Such changes may be the cause of tissue necrosis, until the development of peritonitis. Purulent inflammations are the most frequent types of complications. Inflammation may begin in the edges of the wound in the internal organs and in the area of postoperative seams. Compliance with the rules of asepsis and antisepsis to minimize the risk of similar adverse patient outcomes. When you remove a tumor site using laparoscopic surgery penetration of malignant cells in the region troekurovo hole with the development of tumor growth and metastasis. The formation of hernias in connection with the violation of the integrity of the structure of the anterior abdominal wall can occur in a few months or even years after surgery. A very important quality to take troakara hole and, if necessary, to be used to strengthen the anterior abdominal wall. The most serious complication of such operations – perforation of the intestine with development of peritonitis. But the main reason of complications – failure to perform laparoscopic interventions. The effects of laparoscopy is always easier to prevent than to cure. In this regard, it is especially important to observe proper technique of operation and use only appropriate tools. The most important role in successful treatment is the skill and experience of surgeon operating, what is important to pay attention to. Early detection of complications, especially occurring during the procedure itself (bleeding, violation of the integrity of internal organs, etc.) requires beginning emergency aid, aimed at prevention of progression of complications and development of such difficult situations as peritonitis. In the event of serious consequences surgeons are switching to a laparotomy (open surgery on the abdomen), allowing better control during surgery. The effects of laparoscopy: is there a danger?